When I go to trade shows or industry networking events, I’m constantly amazed at the completely different stories from people about how they got into this industry. It’s one of my favorite questions to ask, as it reveals so much about the other person and where they are on their journey. Some have a business background and started their shop because of an opportunity. Some, like me, have an art background and got involved because it gave them a paycheck to go along with using their creative skills. At the end of the discussion though, you find that everyone lacks something and we’re all searching to fill in that gap. Great business people aren’t really good artists. Creative people are often not very skilled in business. Then there’s the actual craft of learning to print or embroider. Below, I’ve ranked the top 9 core skills that I think every shop should work towards mastering, and maybe a tip or two along the way too. If I left something out, or you don’t like my rankings – leave a comment!! Participation is a good thing. Skills as a Printer/Embroider. Yep, it’s number two. Although many will argue it should be number one, for shop success Communication has to top it, as there are so many other facets and people involved than just printing/embroidering. Still, at number two it ranks high on the list and importance. This is all about craftsmanship. Probably the most wonderful thing about the decorated apparel industry is the mixture of art and science for business. You have to do things correctly in each step along the way in order to have your final production run come out consistently perfect. That takes a tremendous amount of effort in developing those skills. Standardizing how your shop operates, training your staff, and developing the core production skills will be the main drivers for success. I see all too often printers/embroiderers accepting jobs that are beyond their skill level, reaching out on the internet forums for help at the midnight hour. Think you might have to print on a 2-ply jacket, turn a CMYK job, run a puff embroidered hat, or print over hoodie seams? Spend some time researching, attending a trade show how-to seminar, or just mess around with it in your shop and learn how. Take some notes. Keep a journal or log book and record what you did, what worked, and what didn’t. Build a recipe for success that you can come back to six months later when someone requests something out of your norm. By then, maybe you are an expert; or at least skilled enough to know if you can do the job or not. Keep pushing the envelope with your skills, and insist on excellence and quality on your shop floor. Regardless of your decoration method, the key is to keep improving, training your staff, and learning! Business or Marketing Plan. I talk or e-mail a good number of shops all over the world these days. Some have challenges that relate to their sales. All want more business coming in, and are looking for a magic bullet to make that happen. The first question I ask is always “Have you written a business plan?” Surprisingly few have. A good business plan is a living document (it can change!!) that outlines your company, your customers and set some obtainable goals for the next three to five years. Who are your ideal customers? How are you going to reach them? Who is your competition? What are your company strengths? Weaknesses? The business plan aims your company in the right direction and sets the course of your actions. Instead of shot-gunning your efforts all over the place, the business plan can help guide your efforts with better precision as you will have the direction you need to work on achieving goals you have set. A marketing plan is similar, but outlines the communication and branding efforts for your company to achieve your established business goals. The value in spending your time and effort in writing these plans is that they give you the tools and direction to aggressively target your core customers and bring business in, rather than passively waiting for orders to trickle into your company. Ready, Fire, Aim usually doesn’t work. So, if you are reading this and you haven’t written a business plan and set some goals; what are you waiting for? Do yourself (and your company) a favor and grab a cup of coffee and get busy!! Counting & Keeping Track of Inventory. We do a lot with math every day, mostly in multiples of twelve. In receiving and in production, make sure the quantities add up to what they are supposed to be several times along the way. (Calculators are allowed! It’s ok…). At a minimum your receiving team should count and verify everything the same day the goods come in. Checked against the packing slip and your internal work order, every item on the job should be accounted for before anything is staged in production. Any challenges should be reported immediately for action by the account rep or salesperson. 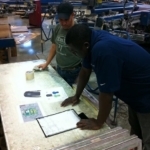 In production, the goods should be verified to be 100% complete before running the job. 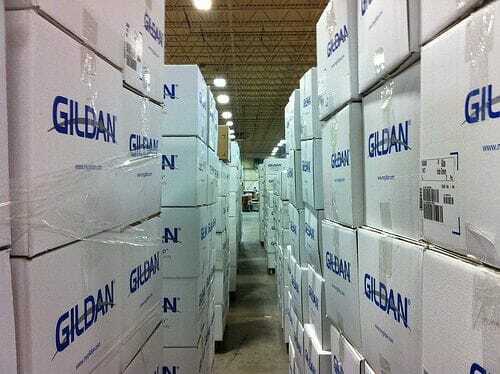 During production, your crews should count and check off from the work order as shirts are being produced to verify that your quantities match up. At the end of the run, all of the numbers should add up and be consistently the same. Misprints and defective shirts during the run should be culled out and reported on the job too. Why insist on perfect counting? This is an easy question to answer from a pure economic standpoint. Just think of each shirt as dollars instead of garments. Would you misplace a box of money? Smaller shops look at this problem and may not comprehend why it even exists…but the larger your shop grows, the more people that touch things along the way, the larger your schedule and stress increases. Insist on excellence along the way.